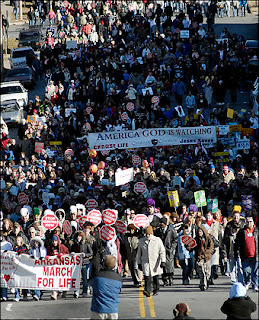 Thousands and thousands of peaceful protesters walk to the Capitol steps (or, you know, as close as Osama bid Laden lets them) for dozens of the 35 years since Roe v. Wade, but that's not really news, is it? Yahoo! is my home page. Nope, nothing there. Google gets misty-eyed and customized on MLK Jr Day, but try finding something about the March for Life. They might not celebrate the day the bloody procedure that keeps them in business was sanctioned, but everyday is a celebration at Abortionclinicdays, where we get to read about a women deluded enough to think she "and her baby" are going to go through this abortion thing together. Marnie had chosen to have a medical abortion and we discussed what that would feel like for her. “It is very important for me to take responsibility for this,” she said, “and do it myself.” She had had a prior miscarriage and felt confident that she could work through the cramping and bleeding as the pregnancy passed. This was going to be private, sacred time, she explained. She had prepared her bedroom at home, bought a new bible and had selected some scripture that she felt spoke to her situation. “I need this to be respectful,” she said, “Me and the baby are going to work through this together.” I offered some scripture I share with women about God's all-encompassing love and we hugged as she was leaving. I told her that I'd be thinking of her and thanked her for letting us care for her. The level of peace and confidence she displayed were so moving. March on. Even if they don't report it. Wait...she and her BABY are in this together? It's not a baby yet, girly! Right? Hmmmmmm. The fact that she acknowledges it as her baby makes it worse. But worse than knowing what she's doing, she says she's "going to work through this" with the baby. And by work through she means destroy. Somehow I doubt the baby is complicit.